Transplant patients and families often experience isolation as the patient’s health declines. 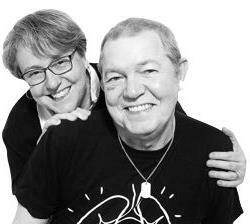 ‘“As transplant patients and families, we share a lot of the same issues and struggles, yet we’re often separated by geography or the nature of the disease the patient has”, explains Beth Campbell Duke, a designated caregiver for her lung transplant recipient husband, Tony. I met Erin Toplak, a local Respiratory Technician on a Facebook support group for BC lung transplant recipients, and we started talking about creating a local support group that would also include video conferencing for those who were unable to physically get to the meeting”. The video conferencing option isn’t just a feature for those who live outside Victoria, but addresses a need of those in the Cystic Fibrosis community. The reality for the CF patients Erin works with is that they know they will require a transplant and are looking for information from other transplant recipients, especially those who have had lung transplants. To make support group planning more challenging, CF patients are unable to attend meetings where there will be another CF patient present because of the risk of transmitting bacteria that cause potentially fatal lung infections. So video conferencing via Zoom was included as part of the plan. The Victoria Transplant Support Group meets the 2nd Friday of every month from 2:30 – 3:30 at the Victoria Disability Resource Centre, 817A Fort Street. For more information: See our webpage at TransplantRogues.com/victoria-support-group or contact Beth@TransplantRogues.com | 250-650-1527.